Drs. Fagadau, Hawk & Swanson offers a full service, comprehensive contact lens department, recognized for finding solutions to the most difficult fits. Steve Fitzpatrick and Claire Shaw are outstanding specialists, with over 30 years of experience. At Fagadau, Hawk & Swanson we provide all brands of contact lenses, along with the newest innovations in contact lens materials and designs. This allows for the best fit for every individual. Multifocal – Would you like the freedom and youthful appearance from not wearing glasses? Multifocal contact lenses are designed to provide good vision to people who have a condition called presbyopia. The key sign that you are developing presbyopia is that you need to hold reading material further from your eyes to see it clearly. Simultaneous vision: The lens centers on the cornea with both the distance and near prescriptions within the pupil area. The eye receives both in-focus and out-of-focus images at the same time. Concentric vision: The center portion of the lens has the distance power and the outside of periphery portion has the near power, or vice versa. Bifocal contact lenses may not be for everyone. If that is the case, monovision contact lens wear may be the answer. With monovision, you wear one contact lens to correct distance vision and the other contact lens to correct near vision. Soft Contact Lenses – Are you interested in wearing a contact lens that is immediately comfortable on your eye? 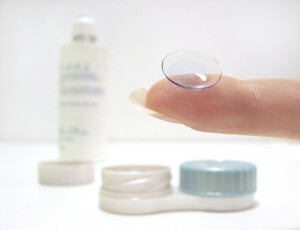 Soft contact lenses are manufactured in different materials with various water concentrations, oxygen permeabilities, designs and production techniques. RGP contact lenses give better vision. Soft contact lenses do not last as long as RGP lenses. Daily Disposable Contact Lenses – Would you like the convenience and safety of wearing a single use soft contact lens? Daily disposable lenses are single use, designed to be worn one day then thrown away. They are the best lenses for intermittent or periodic wear. They can be the most comfortable lenses for dry eye patients or people who suffer from allergies. Daily disposables require no cleaning or disinfection method there for are the most convenient. Rigid Gas Permeable Contact Lenses – Do you want and require crisp, clear vision? Rigid Gas Permeable (RGP) contact lenses, also known as oxygen permeable lenses, are today’s state-of ­the-art hard contact lenses. Most RGPs are made of different compositions of silicone with variations in wettability, oxygen permeability and flexibility. There are some outstanding benefits offered by RGPs over soft lenses. For one, because a RGP is a stiff material, it retains its shape well when you blink, which tends to provide crisper vision than would a soft lens. RGPs are frequently the answer for people who do not obtain acceptable vision with soft lenses. This not only includes some people with astigmatism and presbyopia, but also people who have a condition called keratoconus. Fagadau & Hawk’s contact lens staff is experienced in even the hardest to fit contact lens patients. Keratoconus Contact Lenses: A contact lens to correct irregular astigmatism caused by non-inflammatory thinning of the cornea. Cosmetic Contact Lens: Special contact lens made to hide cosmetic defects in an eye.